Greater Fort Lauderdale Convention & Visitors Bureau (GFLCVB) is a leader in LGBT+ visitation with more than 1.5 million LGBT+ annual visitors. LGBTQ+ market focus by the CVB is to promote GFL’s diversity via a Greater Together campaign and the inaugural Pride of the Americas Festival in Fort Lauderdale in 2020. Greater Together showcases GFL’s welcome to visitors from all other the world regardless of who they love. This campaign served as the inspiration for a showcase event at Pride New York 2018 at the Samsung building in NYC. The Pride Place activation included a colorfully branded area for visitors to interact with gay and transgender brand ambassadors and be photographed and videoed in a Greater Fort Lauderdale “beach setting.” The photos and video were posted to the CVB’s social channels. The event also featured a large mural of the Greater Together signature thumbprint for visitor affixed thumbprints – including NY governor candidate Cynthia Nixon. Firmly establish Greater Fort Lauderdale as the gay capital of America and get out the message that diversity is in the destination’s DNA. The target audience was gay and straight New Yorkers and visitors to New York and the Samsung building. The CVB also wanted to show its pride as a progressive community with one of the largest LGBTQ+ populations in the country. Pride Place also provided an opportunity to arrange business and media meetings for Richard Gray, the only LGBTQ+ Director of Marketing at a CVB in the U.S. “We want to show the world that, even in this political climate Greater Fort Lauderdale is an extraordinary oasis in a generally conservative state, said Richard Gray. “Diversity and inclusion is what makes this area so great to live and to visit.” The pre-promotion of Pride of the Americas 2020 at Pride Place was the first step in a major marketing initiative to attract visitors to the event from every corner of the world. New York Pride is a busy time and place. The CVB wanted an environment for personal interaction and high visibility for the destination’s brand over a week timeframe. This led to the CVB, its public relations agency Finn Partners and Pride Media to stage an event in the Samsung building in Manhattan’s trendy and high-foot traffic meatpacking district. As visitors stepped into the Samsung building they were drawn to a visually striking photo set of Greater Fort Lauderdale, summer dressed brand models, a beach setting and a rainbow surfboard. 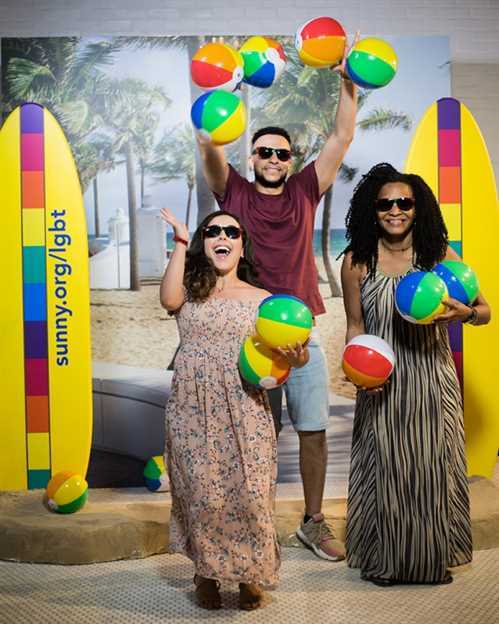 Guests posed alongside the models and surfboard capturing energetic and vibrant user-generated images instantly shared on social media with #greatertogether. The images were also shared on Out Traveler.com, with calls to action to plan a trip at the CVB’s website sunny.org. A camera was set up in time-capsule mode to create a short 30-second video showing the mural creation and featured on OUT.com and OUT’s Facebook and Twitter accounts. The Pride Place activation was a success in promoting Greater Fort Lauderdale as a welcoming LGBTQ+ destination for all visitors. Pride Place featured celebrities, notables, panels, luncheons, film screenings, cocktail parties, music & comedy events and more – all showcasing the GFL brand. The inaugural PRIDE PLACE held at Samsung837 brought the LGBTQ community together for a week-long pride celebration ahead of New York City Pride hosting over 2,000 VIPs. Through a strategic press and social outreach strategy, Pride Media garnered more than 1.5MM media impressions and 2MM+ social media impressions for PRIDE PLACE at Samsung837 In-depth pride coverage across Pride Media’s network of brands, including a custom PRIDE PLACE hub, inspired our readers to celebrate pride authentically and unapologetically resulting in over 13 million-page views.